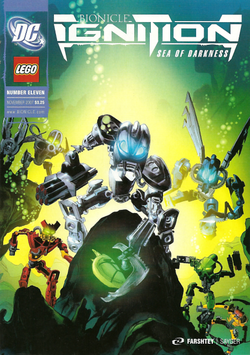 Death of a Hero is the eleventh issue of the BIONICLE Comic series Ignition, and the final issue of the Sea of Darkness saga. It is preceded by BIONICLE Ignition 10: The Death of Mata Nui and is followed by BIONICLE Ignition 12: Realm of Fear. This is also the final issue to be drawn by Stuart Sayger. Facts about "BIONICLE Ignition 11: Death of a Hero"